Obesity and smoking are among the top public health risks, according to an infographic from MPHOnline.org. In fact, the infographic shows that obese adults cost $1,429 more per year in medical costs than healthy weight adults. In addition, smoking causes serious illness in approximately 8.6 million people. This infographic also identifies other public health risks, accompanied by statistics and information regarding causes and at-risk populations. 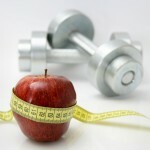 You may also be interested in this related resource: 2013 Healthcare Benchmarks: Health Coaching. Lung cancer accounts for 14 percent of all cancer diagnoses, according to a new infographic from TopMastersInHealthcare.com. The incidence in men has been declining over the past two decades, and the rate in women has just begun to decrease, as shown in the infographic. This infographic also details a timeline of lung cancer, causes, risk factors, experimental treatments, cancer facts versus myths and more. You may also be interested in this related resource: 2011 Benchmarks in Tobacco Cessation and Prevention. 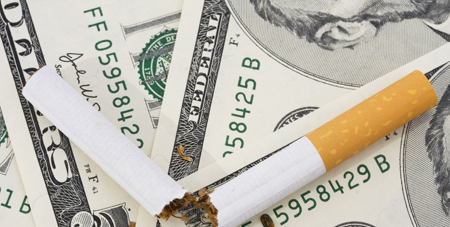 The High Cost of Smoking: Smokers cost more. That’s the bottom line from a new report from Ohio State University, the first study to take a comprehensive look at the financial burden for companies that employ smokers. Presenteeism, or reduced productivity related to the effects of nicotine addition, cost $462 annually. The study focuses solely on economics and does not address ethical and privacy issues related to the adoption of workplace policies covering employee smoking. Increasingly, businesses have adopted tobacco-related policies that include requiring smokers to pay premium surcharges for their healthcare benefits or simply refusing to hire people who identify themselves as smokers. And while researchers acknowledge that providing smoking-cessation programs is an added cost for employers, they stress that employers recognize how difficult it is to quit smoking. 4 Healthy Habits to Reduce Heart Risk, Death: More bad news for smokers: those who otherwise maintain a healthy lifestyle will die sooner than those who do not. According to a new study from Johns Hopkins University, exercising regularly, eating a healthy Mediterranean-style diet, maintaining a normal weight and, most importantly, not smoking can help improve heart health and reduce the risk of death. Researchers found that adopting those four lifestyle behaviors protected against coronary heart disease as well as the early buildup of calcium deposits in heart arteries, and reduced the chance of death from all causes by 80 percent over an eight-year period. Of all the lifestyle factors, researchers found that smoking avoidance played the largest role in reducing the risk of coronary heart disease and mortality. Smokers who adopted two or more of the healthy behaviors still had lower survival rates after 7.6 years than did nonsmokers who were sedentary and obese. The findings corroborate recent recommendations by the American Heart Association, which call for maintaining a diet rich in vegetables, fruits, nuts, whole grains and fish, keeping a Body Mass Index (BMI) of less than 25, being physically active and not smoking, researchers note. Expanding Medicaid Best Option for States: Some bad news, or food for thought, for those policymakers not planning on expanding Medicaid in their states: they will leave millions of their residents without health insurance and increase spending, at least in the short term, on the cost of treating uninsured residents, according to a new RAND Corporation study. If 14 states decide not to expand Medicaid under the ACA as intended by their governors, those state governments collectively will spend $1 billion more on uncompensated care in 2016 than they would if Medicaid is expanded, researchers say. In addition, those 14 state governments would forgo $8.4 billion annually in federal payments and an additional 3.6 million people will be left uninsured. States that do not expand Medicaid will not receive the full benefit of the savings that will result from providing less uncompensated care, researchers note. But they will be subject to taxes, fees and other revenue provisions of the ACA. Commercial Payors Lag Behind Medicare in Offering ACOs: And lastly, commercial payors aren’t offering as many upside-only payment structures that are most popular among early accountable care organizations (ACOs), according to an analysis by the Premier Healthcare Alliance. The study of 85 payor arrangements found that more than one-third were for upside-only shared savings, most of which fall within the Medicare Shared Savings Program (MSSP) or Medicare Advantage (57 percent). Other upside-only options were reported with Medicaid (7 percent), provider-owned plans (7 percent) and self-insured employers (7 percent). However, upside arrangements are lacking in commercial markets. Among the ACOs analyzed, only 21 percent of commercial arrangements offer upside shared savings, and these were clustered in just four markets. In addition, agreements tended to be smaller in scope, usually for 5,000 covered lives or less. People with mental illness smoke at much higher rates than the U.S. population as a whole, but are as interested in quitting as other smokers and can quit successfully with more intensive smoking cessation treatment. Those are the conclusions of a recent report released by the Centers for Disease Control and Prevention (CDC) and the Substance Abuse and Mental Health Services Administration (SAMHSA), which found that adults who suffer from mental illness are 70 percent more likely to be cigarette smokers. 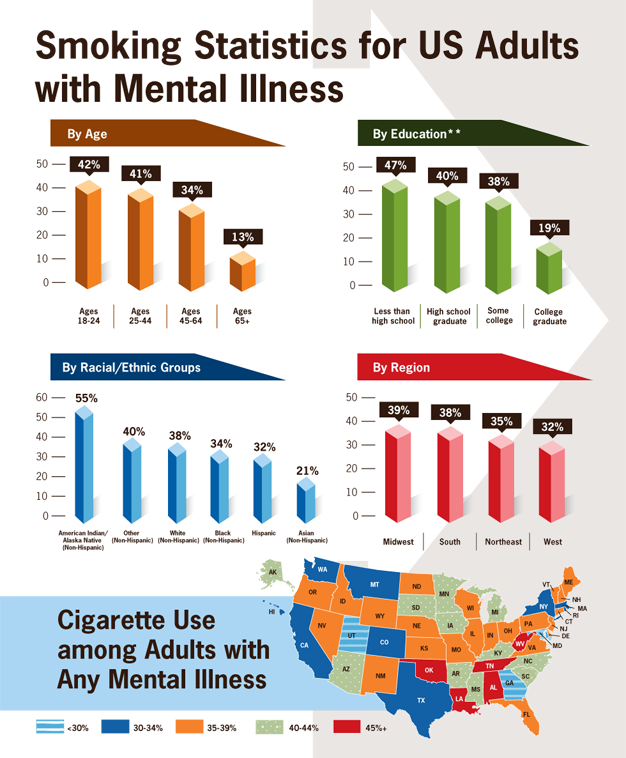 About 36 percent of adults with mental illness smoke, compared to 21 percent of adults with no mental illness. healthcare data. Click here to sign up today. Showing up isn’t enough any more to earn a cash- or benefit-based incentive for health improvement, say respondents to HIN’s fourth annual Health & Wellness Incentives survey. Instead, employers and health plans are rewarding measurable achievements in health behavior change &#151 weight loss, smoking cessation, BMI reduction or other lifestyle changes that reduce an individual’s risk of developing or exacerbating a chronic (and costly) illness. While completion of a health risk assessment (HRA) remains the most heavily incented health improvement activity for the fourth consecutive year, according to two-thirds of survey respondents, more companies are incentivizing the lifestyle behavior changes of weight loss (57 percent) and smoking cessation (51 percent) than 2011’s favored activities of preventive screenings and participation in on-site wellness. In other survey findings, the use of texting to communicate incentive program details doubled in the last year, from 7 to 14 percent. 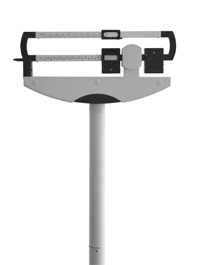 Social networks and health portals also gained favor for this purpose. At the same time, more are relying on the more traditional communication modalities of work site flyers and table cards, a trend that has risen steadily from 61 percent in 2009 to 68 percent in 2011 to 84 percent this year. “You have to leverage the right tools and techniques matched to those consumers or their preferences,” notes Jay Driggers, director of consumer engagement at Horizon Blue Cross Blue Shield. A key area of study for Driggers’s consumer engagement team is behavioral economics, which he refers to as “the carrots and the sticks, things that will motivate people to change their behavior or to do something.” Incentives fall into this category, he says. The survey also identified a 2 percent increase in the awarding of incentives via contests and drawings, a practice reported by 57 percent of 2012 respondents. “In most cases, I think a lottery can be a cheaper option that will drive more participation than a one-to-one reward,” suggests Driggers, who recently outlined Horizon’s approach to consumer engagement in its patient-centered medical home initiative. The number of respondents reporting incentives program ROI of between 3:1 and 4:1 has doubled in the last 12 months, from 2.6 percent in 2011 to 5.3 percent this year. Program ROI of between 2:1 and 3:1 remained constant at 14 percent from 2011 to 2012. The use of biometric screening to identify participants for incentive-based programs rose slightly in 2012 to 40 percent, up from 36 percent in 2011. Opt-in or self-registration remains the top identification tool, at 62 percent. Group incentives lost some favor this year, in use by just 23 percent, versus 36 percent of 2011 respondents. In new survey data this year, 20 percent extend eligibility for health and wellness incentives to domestic partners. For more survey highlights, download the executive summary of Health & Wellness Incentives in 2012: Rewarding Risk Assessment, Lifestyle Changes. A detailed analysis of these metrics, including year-over-year trends, is provided in 2012 Healthcare Benchmarks: Health & Wellness Incentives.